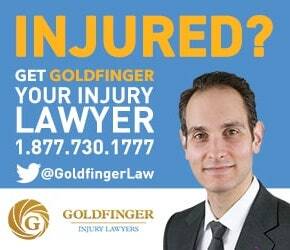 At Goldfinger Injury Lawyers, we know that finding a personal injury lawyer can be an intimidating process. This is likely your first serious accident, your first serious insurance claim or your first time having to seek out a lawyer in order to protect your rights. You probably have a ton of questions about your injury, your accident, your claim and your personal injury case. We want to make the entire legal process, from the initial consultation with you, to the time your case closes, as simple and as easy to understand as possible. As a pledge to our clients, we have developed the Goldfinger Guarantee. In the practice of law, there are no guarantees. But in the practice of helping people put their lives together after a bad injury or accident, we can make a few guarantees without hesitation. The Goldfinger Guarantee are a set of rules which our firm has followed since its inception. These rules, or Guarantees, have given our law firm an outstanding track record of success and client satisfaction. Goldfinger Guarantees that YOU, the client, come first. Goldfinger Guarantees that you won’t pay any legal fees until your case settles. Goldfinger Guarantees that you will get straight forward, easy to understand answers. If you don’t understand something, just let us know and we will explain it to you in a different way to make sure you understand it. Goldfinger Guarantees that you will have unfettered access to a personal injury lawyer to answer all the questions about your case. Whether it’s by phone, fax, snail mail, face to face meeting, Skype, email, smoke signal or Twitter, you will have access to the Goldfinger Injury Lawyers team. Goldfinger Guarantees that your query will be answered within 24 hours, if not sooner. Goldfinger Guarantees that we will do everything in our power to ensure that we get the best result for your personal injury or disability case. Goldfinger Guarantees that we do not represent insurance companies or financial institutions. Goldfinger Injury Lawyers is 100% accident victim oriented law firm which represents real people with their real accident and disability claims. Insurance companies work hard to defeat your claim. Goldfinger Guarantees that we work harder.